We have caught a few bands on the road this autumn using Kinesys automation kit in many formats to accomplish a diversity of creative tasks … here are two of our favourites so far. 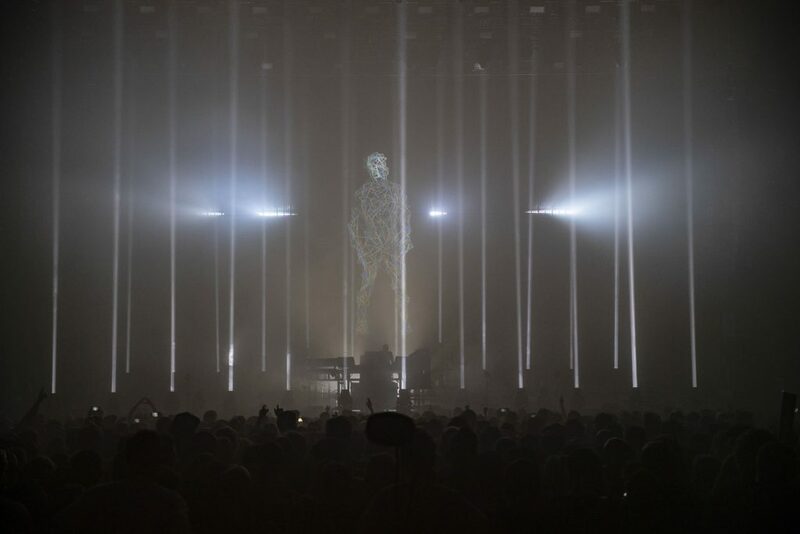 Summer and early autumn saw the Chemical Brothers on the road completing a hectic festival schedule followed by a week of high-profile headline shows, complete with another fantastic visual experience created by show designers Adam Smith and Marcus Lyall (@smithandlyall). This blended effervescence, excitement and new ideas with much loved vintage Chemical Bothers visual gags like their large-scale dancing robots! The fully integrated Chemical Brothers lighting and video show featured a large LED screen upstage with five moving (trussing) pods behind it, each loaded with a Robe MegaPointe moving light and some LED battens – adding some optical mystery to this vibrant equation. These were automated on 10 x Kinesys motors being run on a K2 controller, supplied by rental specialists Lite Alternative together with all the tour’s lighting and rigging equipment. The pods changed positions constantly throughout the set, so fans were aware of moving light sources as the they flew up and down with lights blasting through the screen. However, being masked by the screen, it wasn’t immediately apparent where they were in relation to the stage … adding another layer of optical depth and texturing to this very multi-faceted picture. The Chemical Brothers are well known for their interactive, eye-catching and entertaining visual shows, a perfect confluence of lighting and video which, with the band’s preference to remain in silhouette, is a significant element of all their live performances. Another recently completed HSL tour utilising Kinesys featured a stunning, elegant and slick show design by Andy Hurst. Astley launched his new “Beautiful Life” album to great enthusiasm, but his many fans from all generations also wanted to hear his 1980s dance stompers like “Together Forever” and “Never Gonna Give You Up”. 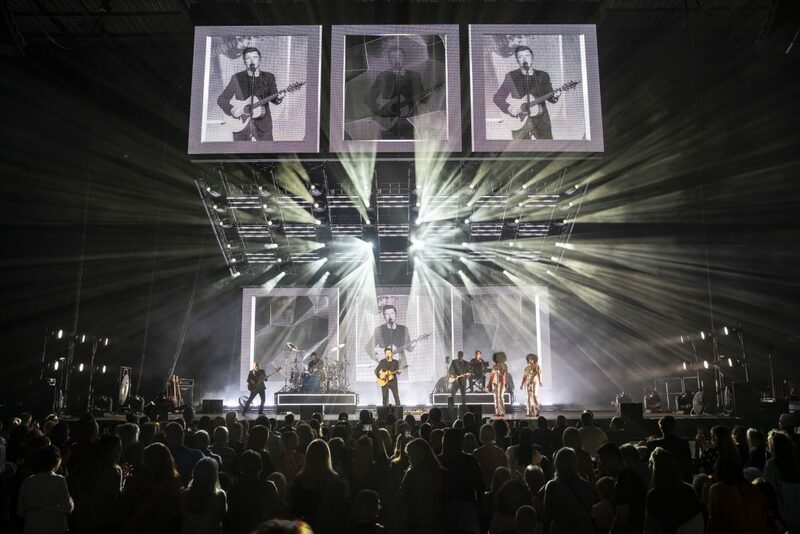 Andy’s design featured two identical large LED screens … one upstage and one downstage. The downstage one moved up and down on four Kinesys points controlled by Kinesys’ flexible and straightforward Vector software. 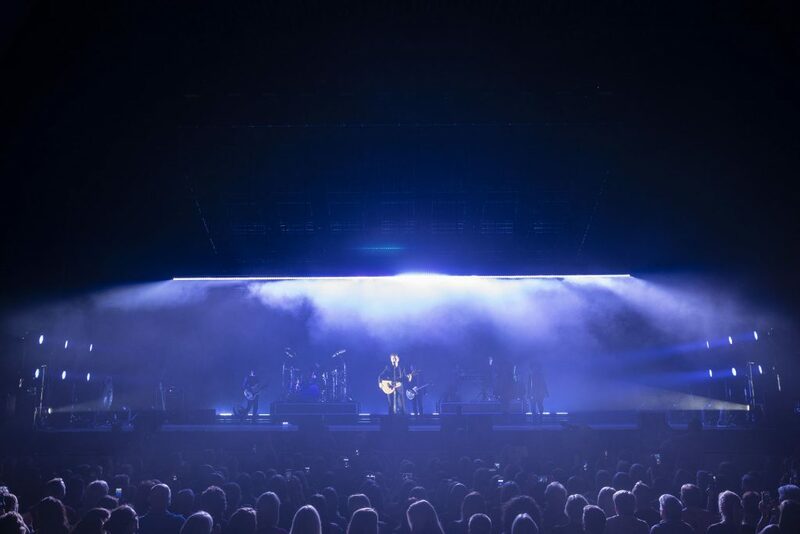 It started in the down position as Astley made a dramatic stage entrance silhouetted against the LED screen, and as the first song gained momentum, the screen raised smoothly and seamlessly to reveal the stage, set and band behind. In the up position, this front screen formed part of the overall architecture defining the geometry of the stage design. The screen moved twice also coming in at the end of the last number of the set, with Astley and all the band silhouetted in front of it as they stepped forward and exited stage left. These two classy moves created exactly the dramatic theatrical effect that Andy wanted.